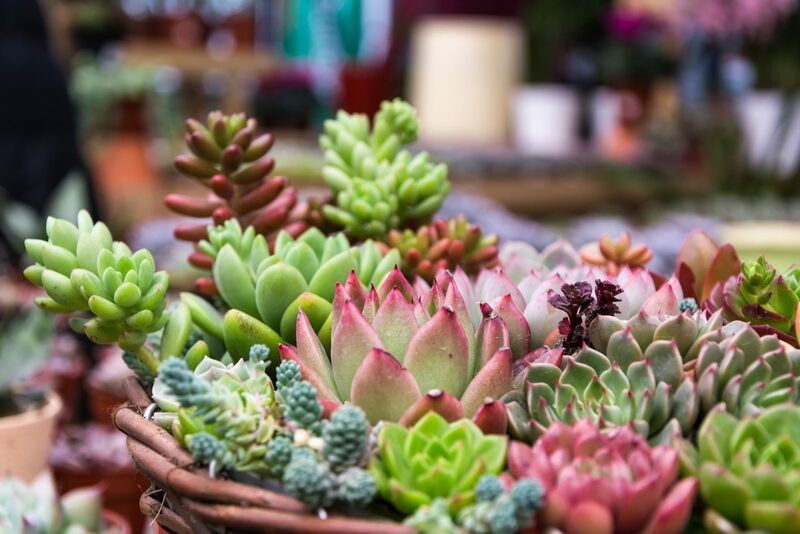 Succulents store moisture in their fleshy leaves and stems, which better equips them to survive periods of drought and thrive in arid climates. Their shallow root systems have evolved to absorb as much moisture as possible in areas where rainfall is infrequent or light, which also helps them thrive in drought-prone areas. Although succulent plants are often associated with the desert, there are some varieties that grow in tropical areas, mountainous regions or near bodies of water. Planting succulents allow you to create a low-maintenance, low-water landscape with vibrant hues, varied textures, and colorful blooms. You can select varieties that will act as ground covers to cover large areas or smaller specimens that can be grown on a tiny patio. The versatility and easy-care qualities of succulents make them a solid choice for gardeners who do not have a lot of time to tend to their gardens and folks who live in drought-prone areas but still want beautiful, inviting outdoor living areas. There are two main types of succulents: halophytic succulents and xerophytic succulents. Halophytic succulents are often found in marshy areas and are salt-tolerant plants that thrive in coastal areas with salt spray or saline soil. Xerophytic succulents include the varieties we most often see available in nurseries and that are most popular for landscaping in drought-prone areas in Southern California. This type of succulent thrives in arid regions and offers low-maintenance options for indoor and outdoor plants. 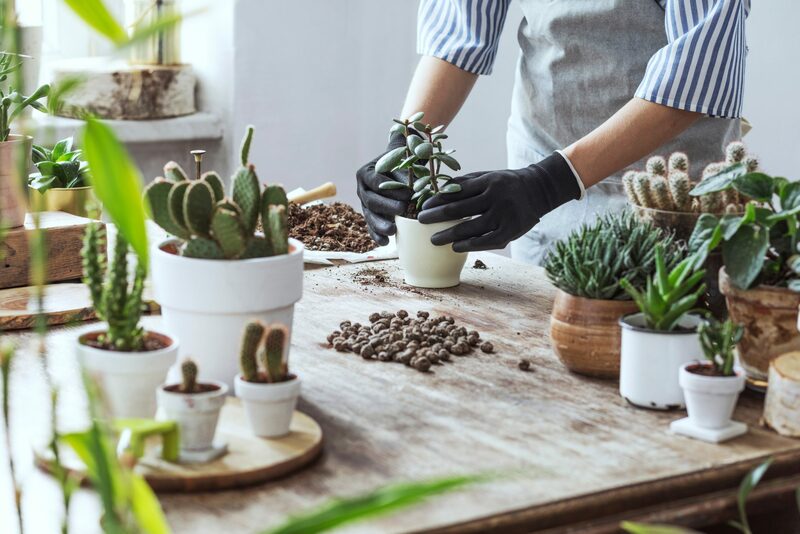 Because xerophytic succulents are most popular and far more likely to end up in your garden, the following recommendations primarily focus on planting and caring for this type of succulent. Succulents prefer porous, well-draining soils and do not do well in soggy soil. If you are planting in containers or raised garden beds, fill the container or area with a cactus mix or succulent mix, which are widely available at garden centers. To amend your current soil or potting mix that you already have on hand, mix in vermiculite or pumice to make it more porous and enhance drainage. Succulents can be grown indoors and outdoors and can thrive both in the ground and in containers. If you are planting succulents in containers, you can move them inside when the temperature is expected to drop below freezing or can move them out of the sun on particularly hot days. Some varieties of succulents, such as sedum, can withstand low temperatures, but most are not freeze tolerant (or even frost tolerant) and will need to be protected on the coldest days of winter. Most succulents can tolerate some shade but need at least six to eight hours of light each day. In most cases, this does not have to be direct sunlight, which is why succulents can grow so well indoors. Eight hours of indirect light will work just fine, so be sure to place indoor plants where they will get sunlight throughout the day. 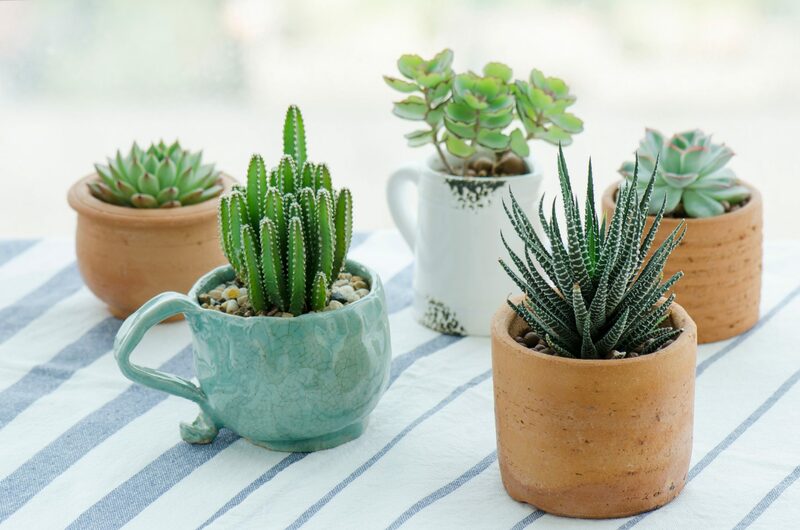 Succulents that receive too much direct sunlight, either outside or through windows, will probably burn, so make sure to provide protection to exposed succulents when it is particularly hot and sunny. If you are planting succulents in containers, place gravel at the bottom of the container to enhance drainage. You can increase the drainage of your pot even more by also mixing a small amount of gravel into the soil before adding the succulents. If you are growing succulents in the ground and are concerned about drainage, you can also mix some gravel into the soil here before planting. When choosing gravel to add to containers or mix into soil, choose smaller options, such as pea gravel. It is possible to plant succulents in bowls and containers without drainage holes, but it is much better to choose containers with drainage holes. If your containers do not have drainage holes, you will need to water your succulents less frequently to avoid root rot. Once you have prepared your container or garden bed, the next step is planting your succulents. You can grow succulents from seeds, but most gardeners find that this takes far too long. Seeds of most varieties will germinate in about three weeks, but be sure to read the seed packets before selecting seeds to plant, since some can take up to a year before you see anything peeking through the soil. Once germinated, you can expect to wait somewhere between six months and one year before your seedlings are ready to transplant into larger containers or garden beds. If you do not have that kind of time – or the required patience – it is much faster and easier to grow succulents by purchasing plants at your local nursery that you can then transplant into your garden. This will allow you to begin to enjoy your succulents right away. To transplant a nursery plant into your garden, make a hole in the soil large enough to accommodate its root system, remove the succulent from the nursery container, gently place it in the soil, and loosely fill in the soil around it. Gently press on the soil near the base of the plant to make sure the soil is firm enough to hold the plant upright. Do not firmly pack soil around the plant. You can also grow succulents from cuttings. This means that you can take a section from an established plant and plant it in your garden or a container to grow into a new plant. Some varieties of succulents regularly provide you with tiny plants (known as chicks) that you can remove from the main plant (known as the hen) so that you can plant them in different parts of your garden. For other types of succulents, you can simply cut off a stem or leaf to create a new plant. After you remove the stem or leaf, allow it to dry out and form a callus on the part where you separated it from the mother plant. This usually takes one to three days. If you are working with stem cuttings, you can now place them in the soil to allow them to begin establishing roots. If you are working with leaf cuttings, you can either gently push the callused end into the soil, or you can lay your leaves on top of the soil and wait for roots to begin to develop before planting them. Many gardeners never feed their succulents and have beautiful, healthy plants. Others regularly fertilize their succulents to make sure they have the nutrients they need to thrive. If you choose to feed your succulents, you can purchase an organic fertilizer specifically made for succulents or you can choose a general, organic fertilizer and give your succulents about half the amount you would normally give another type of plant. Fertilize your plants between one and three times each year. Most succulents do best when watered about once per week. They do not like soggy soil and do not like sitting in a saucer filled with water. You are more likely to kill your succulents by overwatering them than by underwatering them, so make sure the soil is dry before giving them more water. Your succulents will need more water during their growing season in spring and during the hotter months of summer. They will need less water in winter. In general, you should check the soil once a week. If it is dry, water your plants. If it is still moist, allow it to dry out before watering again. This is just about everything you need to know to successfully grow succulents, which shows just how easy it is to plant and care for these low-maintenance plants. 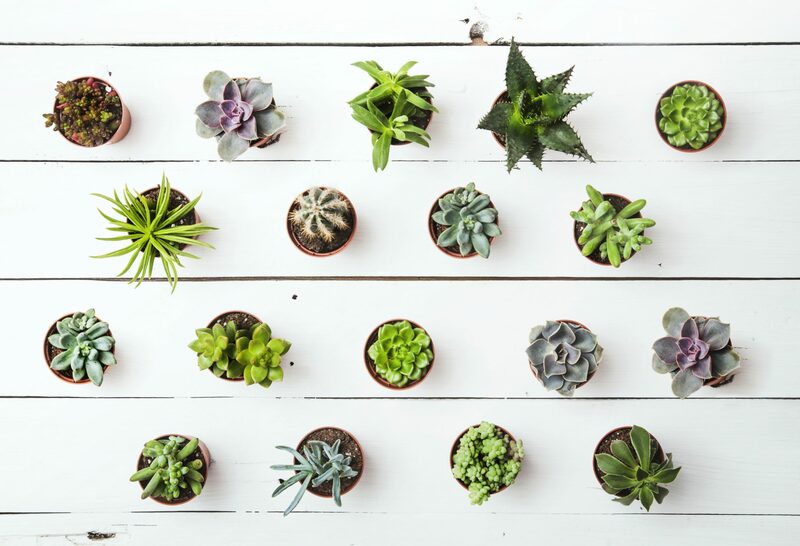 Keep in mind that every succulent is different, so you may need to do some research or experiment a little to see which ones prefer more sun, less water or more fertilizer to make sure all of the plants in your garden thrive.